PDF emailed to admin upon submission? Home › Forums › Pre-Sale › PDF emailed to admin upon submission? 1. When a user submits a form through the website, can a PDF of the completed form be emailed automatically to admin, or does the user have to download the PDF manually then give it to admin manually? 2. Can a PDF copy of every submitted entry be downloaded via the dashboard at a later date? 3. Are there any size limitations to the form that the PDF will work as outlined above (if the above is possible)? 1. Yes using Formidable’s Email Notifications. 2. 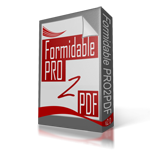 Yes, using PRO2PDF’s export tab or you can create a Formidable View and include the PRO2PDF shortcode. 3. Yes, 4MB is the approx. maximum, however, up to 5MB may be possible depending on your server’s settings and network latency. Reply To: PDF emailed to admin upon submission?